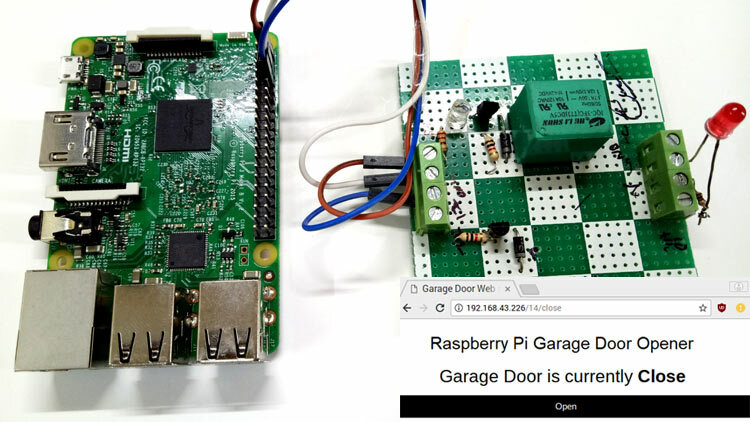 Here in this tutorial we will build a Smart Garage Door Opener using Raspberry Pi. Here a Raspberry Pi web server will be created to open and close the garage door using your smartphone. It is assumed that your Raspberry Pi is already flashed with an operating system and is able to connect to the internet. If not, follow the Getting started with Raspberry Pi tutorial before proceeding. Here we are using Rasbian Jessie installed Raspberry Pi 3. Here External Monitor using HDMI cable is used as display to connect with Raspberry Pi. If you don’t have monitor, you can use SSH client (Putty) or VNC server to connect to Raspberry pi using Laptop or computer. Learn more about setting up Raspberry Pi headlessly here. Connect the Garage door opening mechanism to the output of the relay. Here we have just connected an LED with relay for demonstration purpose. Here, we have created a web server using Flask, which provides a way to send the commands from webpage to Raspberry Pi to control the Robot over the network. Flask allows us to run our python scripts through a webpage and we can send & receive data from Raspberry Pi to web browser and vice versa. Flask is a microframework for Python. This tool is Unicode based having built-in development server and debugger, integrated unit testing support, support for secure cookies and its easy to use, these things make it useful for the hobbyist. You can learn more about the programming using Flask here, also check our previous projects where we have used Flask to control robot through webserver, send the message from Webpage to Raspberry Pi and send weight value to Raspberry Pi in Smart Container. Now, we will write a python script for our garage door web server. This script will interact with our Raspberry Pi GPIOs and sets up the web server. So, this is the core script for our application. Complete Python Script for door opener is given at the end, here we have explained few parts of it. First, make a folder. All other required folders should be in this folder only. Run below commands to make folder and the create python file named app.py inside this folder. This will open the Nano editor where we have to write the script. Start by including important libraries. Now, create a dictionary as pins to store the pin number, name, and pin state. You can use more than one pin according to your need. Then, set the pin as output and make it low initially. Now, make a main function to read pin state and store this state in a variable. We have to pass this data to our html page so, that we can control the input button state. Now, make a function to handle the requests from the URL with the pin number and action in it. Convert the pin from the URL into an integer. If the action part of the URL is "open," then do the following. You can copy the complete script from the end of this tutorial and save it using ctrl+x and then press enter. We have done with the python script. Now, we have to make a HTML page to interact with the python script. In the same garage_door folder, create another folder named templates and inside this folder make an .html file using below commands. Here the important part is to create a button to open and close the door and assign a state to open and close button. The button will send and fetch the GPIO state from the python script. You can use the above given HTML code in the editor and save it. Now the web server is ready to launch. Open the browser and enter your raspberry pi IP address and hit enter. To find your IP address you can run the below command in terminal. You will see a page like this. Make sure the relay module is connected to raspberry pi. Press Open button to switch on the Relay or to open the Garage Door. You can also see the state of the relay. As soon as you turned On the Relay, button text will be changed Close to turn off the relay. Now when you click the button again the relay will be turned off and the button text will be changed to Open again. To stop the server press ctrl+c . So just connect this relay to some Door Opener mechanism, which are readily available in market, and start controlling the garage door using Smartphone. A demonstration Video is given below.